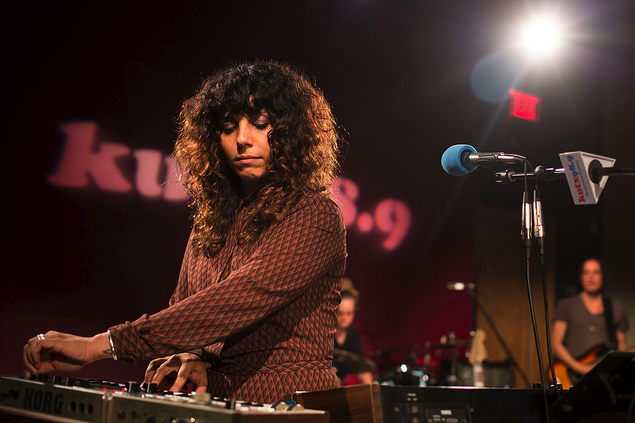 Night Glitter performs at the KUTX studio last month. First up, it’s KUTX Artist of the Month, Night Glitter. This Austin band has an interesting resume: LouLou Ghelichkhani sings with Thievery Corporation and John Michael Schoepf has played bass with Roky Erickson and Hayes Carll. Their debut EP, Hangin' On A Dream, is awfully dreamy, especially on "Believe." Be sure to catch Night Glitter as KUTX's guest DJs this Saturday at 6 p.m.
Also this Saturday, Jamila Woods will help celebrate KUTX's fifth birthday with a concert at Hogg Auditorium alongside Sarah Jaffe and our special guest, Iron & Wine. Woods is a star in the making, and here she is teaming up with fellow Chicagoan Chance The Rapper on "LSD." Finally, a song from Cautious Clay. Don’t let the jokey name fool you — this guy makes some seriously cool music. His debut single, "Cold War," somehow sounds both sparse and lush.